Galil Motion Control, announced the DMC-300xx Pocket Motion Controller Series, their latest generation, single-axis Ethernet motion controller. It combines a high performance motion controller and a 800Watt sine drive in a low cost, compact 3.9″ x 5.0″ x 1.5″ package. The DMC-300xx is also available as a controller-only model which can be connected to a stepper or servo motor amplifier of any power range. Using a 32-bit RISC processor and improved power technology, the DMC-300xx provides higher speed, better power efficiency and smaller size than their prior generation controllers. The DMC-300xx is designed for single-axis motor control applications where compact size, low cost and remote location are important. The DMC-300xx is higher speed than Galil’s prior generation single-axis controllers; The 125 microsecond servo loop update time is twice as fast and the 15MHz encoder frequency and 3 MHz stepper pulse output are 25% faster. The DMC-30012 model is packaged with an 800W amplifier for driving brushless servo motors at 20-80 VDC, up to 10 Amps continuous, 15 Amps peak. The fully digital, transconductance amplifier is a sinusoidally commutated brushless motor amplifier which minimizes torque ripple compared to drives using trapezoidal commutation. This is especially important for applications using low friction linear motors. The amplifier provides commands for initialization of the brushless motor using either hall sensors or encoder feedback. Other features of the DMC-300xx motion controller include PID compensation with velocity and acceleration feedforward, non-volatile memory for user programs, multitasking for simultaneously running up to four programs, and I/O processing for synchronizing motion with external events. Modes of motion include point-to-point positioning, position tracking, jogging, contouring, electronic gearing, ECAM, and PVT. The DMC-300xx provides optically isolated inputs and outputs as a standard feature. I/O include forward and reverse limit inputs, homing input, 8 uncommitted digital inputs, 4 uncommitted digital outputs, 2 uncommitted analog inputs and 1 uncommitted analog output. The DMC-300xx accepts position feedback from both a main and auxiliary encoder. Quadrature encoder feedback is standard with BiSS and SSI formats available as an option. A 115 kb RS232 port is also provided. The DMC-30012 controller and 800W drive unit is $695 U.S. in single quantity and $445 in quantities of 100. 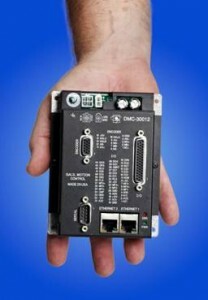 The DMC-30010 controller-only unit is $295 in 100 quantities. The DMC-300xx is available for immediate delivery.